So impressed was I by the Helikon EOD/Utility Pack (see Review Here ) that I thought I'd take a look at the Helikon Camogrom Soft Shell Jacket APCU (Advanced Protective Combat Uniform) Level V which is breathable, lightweight and also windproof. 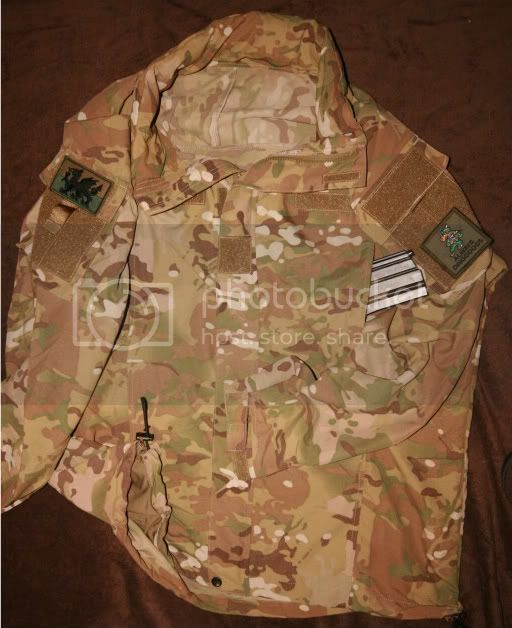 •3 x Velcro panels on the front (2 above chest pockets, 1 mid centre) for attachment of name tapes and rank badges. 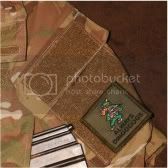 •Velcro panels on sleeve pockets for attachment of insignia. •Roll away hood in collar. •Two zip closed high front pockets to allow access when wearing belt webbing or climbing harness. •Under arm pit zips for ventilation. •Front zip is closed by YKK zip and is covered by a protective flap which is secured by Velcro. •Elastic and Velcro closed cuffs. My first impression was that with the material and weight that I'd be lucky to stay dry in this jacket. My mistake, I've used this a good few times now in light rain and a medium down pour and with a fleece underneath it, it stayed warm and dry. It also did a fair job at keeping the wind out as well! 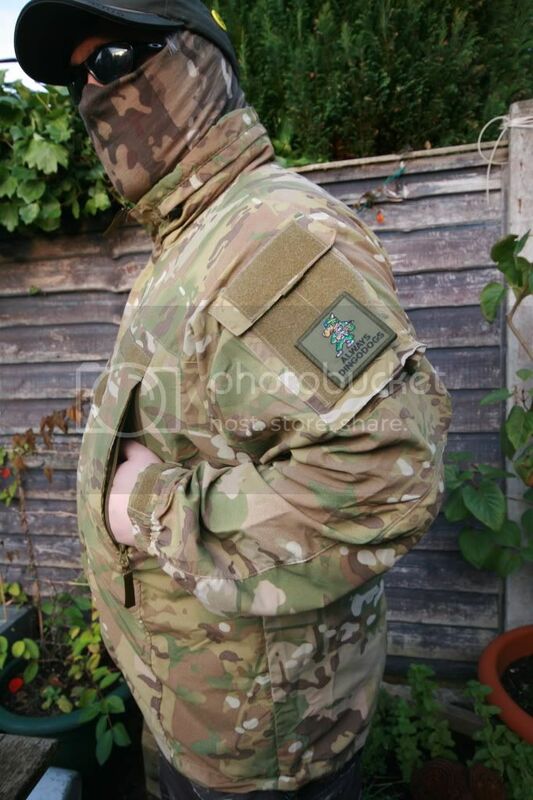 The pockets on this jacket are a good size and well placed with the arm pockets sensibly angled for access and plenty of Velcro for all those essential unit & morale patches as well as those on the main body for name and rank tapes. My criticism here is that maybe blank panels could have been provided to cover these if not used. All zips are good quality YKK zippers so no ripping open or breaking and for those really hot skirmish days you can let the heat out with the underarm zips for some quick cooling down. Each zip has a 'pull-tag' to ease operation whilst wearing gloves. 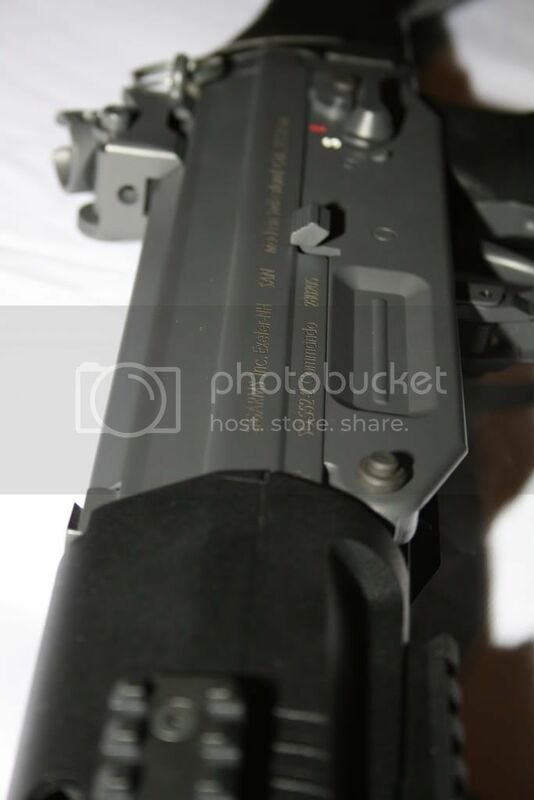 The high position of the front pockets allows their use whilst wearing belt kit or even a plate carrier (so long as it doesn't wrap around under the arms). Sadly no internal pockets but you can adjust the jacket hem by the use of the toggles and shock cord. You should note that most websites recommend getting one size down from your normal sizing as they appear to be made one size up from their labeling system. I'm guessing this is due to the expectation of a layering system being utilised and that the jacket will be worn over a fleece etc. 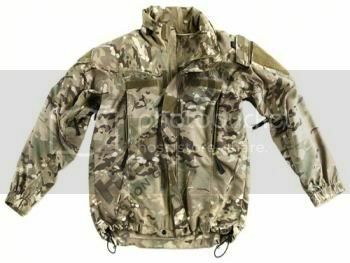 If you enjoy the great outdoors then this jacket is light weight enough to pack in a day bag and is useful enough for most outdoor hobby activities. How does it compare pattern wise to the other crye multicam yosser? much noticeable difference or not? Hows it coping now the weather is turning colder and wetter? You still happy with it? as part of a layering system it's working well. I've been wearing it over a fleece and it's keeping me warm and keeping the wind out. It copes with light drizzle well - but i've not worn it during a typical down pour yet. Not sure how it'd cope. I have one of these Camogrom softshells. They're quite good for the money you pay, but they won't keep you dry when it's really raining. thats why I qualified the 'staying dry' bit to light shower or medium down pour...and heavy rain and you WILL get wet. If you want to stay totally dry in wet weather got for the Soldier 2008 Field Parka by Helikon - see the review on this BLOG! Anyone worn this in UK summer weather? Tempted to get one instead of a new TCU shirt, not sure if itll be too hot. Also, are the chest pockets mesh lined? thanks for the comment - it's fine for use during a typical UK summer - it will hold up to a light shower ONLY anything heavier and you will get wet (also if washing recoat with a waterproofing spray)- pockets are similar mesh to standard Helikon products.